How many casinos would be ideal for Atlantic City? 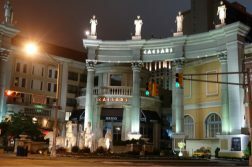 The South Jersey island maintained 12 casinos even after the 2006 opening of rival facilities in Pennsylvania and New York, leading Wall Street analysts on an annual East Coast Gaming Conference panel to make repeated observations that seven or eight had become a more realistic number. Finally, in 2014, four casinos well by the wayside: Showboat, Revel, the Atlantic Club, and Trump Plaza. Two years later, Trump Taj Mahal followed suit. The seven surviving Atlantic City casinos saw revenues blossom as they each gained larger slices of the pie. And the addition of online casino gaming in 2013, which started slowly, soon actually grew the pie significantly. Then in 2018, Trump Taj Mahal was reborn as Hard Rock Atlantic City, while Revel was transformed into Ocean Resort. Now, recent news suggests that the number could go up by one, down by one, or there could be a 1-for-1 trade to leave the city with nine casinos. Last week, Philadelphia-area real estate developer Bart Blatstein announced plans to open a new casino adjacent to the former Showboat property. The vision? An emphasis on eSports and anything else that will attract a much younger demographic. The Showboat property, previously the source of a thorny conflict with Caesars, would be repurposed for apartments. Can a revived Atlantic City handle 10 casinos? It’s worth looking at the state Division of Gaming Enforcement’s most recent figures, from February. The overall industry was up in revenues by 26% compared to Feb. 2018 — which sounds like happy days are here again. But five of the seven “holdover” casinos saw their brick-and-mortar revenues decline. Only Resorts and Caesars bucked the trend. Meanwhile, a report by Reuters last week has Caesars talking merger with Eldorado, which last year purchased the Tropicana property in Atlantic City. Caesars already owns the Harrah’s, Bally’s, and Caesars casinos in Atlantic City. Would a merged company want four properties there — three of them on the Boardwalk? And would the threat of yet another Boardwalk competitor in Blatstein influence high-level thinking? Again, Caesars used to own Showboat. Then Caesars sold it to Stockton University in 2016, but the deal went sour so Stockton sold it to Blatstein a year later. Meanwhile, billionaire Icahn sold Tropicana to Eldorado last year. Now the 83-year-old Icahn has become the largest shareholder in Caesars and is calling many of the company’s shots. For years, Bally’s has been seen as the next most likely candidate for closure, since Caesars already had two other AC properties. 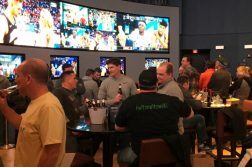 The opening of a sportsbook at Bally’s — and the lack of one at nearby Caesars — has been seen as a good sign for Bally’s. For the city, Atlantic County, and the region, the more casinos the merrier. More than 10,000 jobs were lost in the contraction, the bulk of them solid middle-class employment. The decline accelerated the county’s nation-leading foreclosure tailspin. But now Icahn and Blatstein have their own plans, and we’ll just have to wait and see how it plays out. And if all of this rich mogul intrigue reminds you a little bit of Trading Places, you are forgiven. Also an understandable connection to cross your mind: the game of Monopoly, which happens to use Atlantic City’s streets as its street names.